We had hoped to go retrieve the minivan from the air conditioning shop on Friday, but at 4:30 they called to tell me that it was not coming together as quickly as they expected. I didn't want to do it, but said that Monday would work, albeit that it would be very inconvenient. They were massively relieved. Lisa and I went to Reno anyway because there was pre-Worldcon shopping we needed to do. We first stopped at the Alamo struck stop in Sparks to have dinner at the Iron Skillet, which has a reasonably priced seafood buffet on Friday. 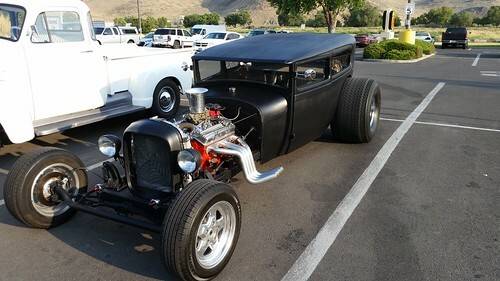 It's Hot August Nights in the Reno/Sparks area, so one will see all sorts of odd vehicles in town. Someone put a lot of work into this monster of a vehicle. After dinner, we did the various shopping trips for things we want for Worldcon. Normally we stay out of Reno/Sparks during Hot August Nights because the traffic is so bad, but it wasn't too awful last night. This weekend we get to pack, except we don't have a vehicle yet in which to pack things. Monday night/Tuesday morning is apt to be a bit hectic. Our original plan to drive part-way to San Jose and use my free-night-anywhere-in-IHG offer to say somewhere along the way is pretty much scrapped now.